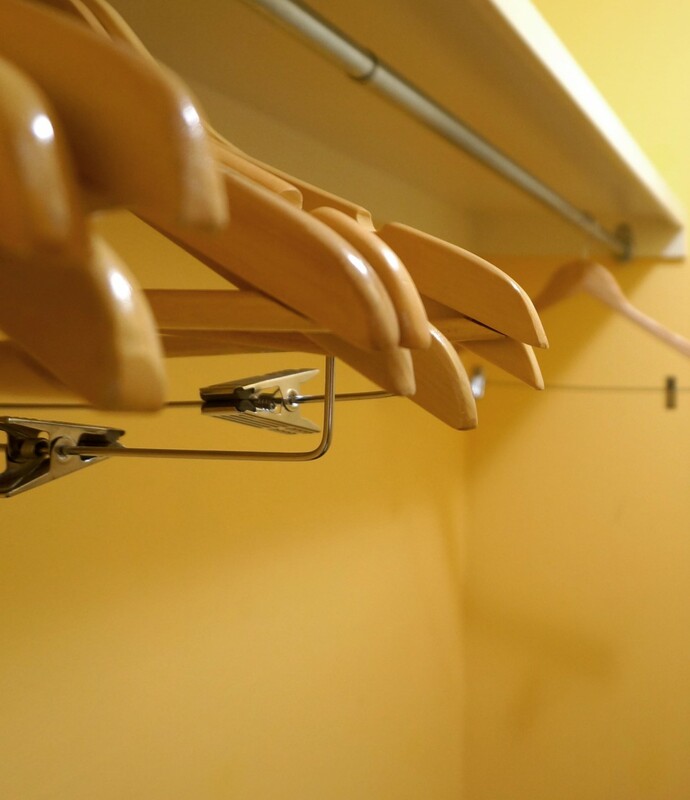 One day, I packed up my entire closet and donated it to charity. This blog is about what happened next. 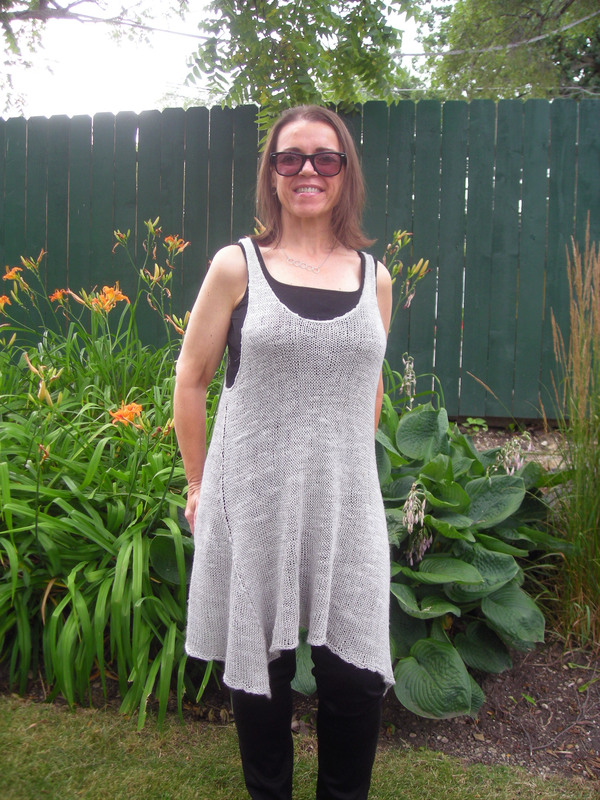 This is the Liesl tunic knit in Classic Elite Firefly, a linen and acrylic blend. The yarn was a disappointment. It biased badly, and no amount of hard blocking could completely remove the bias. If you look closely, you can see the side “seam” stitch — actually a false seam where the garment shaping is done — torquing to the front of the knee. It’s pretty bad. I had wanted a pure linen yarn for this project, but the shop owner suggested this instead, and of the yarns she had in stock, this was the best option. It wasn’t quite right, and I knew that at the time, but it was closer than anything else she had. I nearly didn’t buy it anyway. I nearly came home to order something online so I could get what I wanted. But I was eager to cast this on because I thought this tunic would extend the life of my meager collection of tanks and jeans. As you see above, throwing it on over a tank and jeans really transforms the outfit. So the garment works well in that sense, but I do wish I had waited and used a different yarn. This yarn might be fine for other sorts of projects, but knitted in the round, it was a failure. I’ve been on the hunt for a wide belt to wear with this outfit, something that will restore my shape and keep this from looking boxy and linear. So far, I haven’t found one I liked. I found one I almost liked, almost, and I very nearly bought it. But my experiences knitting the “almost right” yarn have made me reluctant to spend on other “almost right” pieces. I need too many things right now, and my wardrobe is too meager. I can’t spend on things that are just okay. Everything has to work well right now. So the hunt for a good wide waist cincher continues. I can’t really rate this project a wadder because I do wear it sometimes, but it’s definitely not a grand success. Someday I’ll find a silvery-gray linen yarn, pure linen, in a sufficient quantity to reknit this. Until then, I’ll make do with the one pictured above. I think of “almost right” projects as learning experiences because they always show me a better way to do something next time. This also makes it easier to deal with the disappointment of a finished object looking less than perfect. What tactics do you use to cope with an “almost right” project? Goodbye, Summer. We Hardly Knew You!